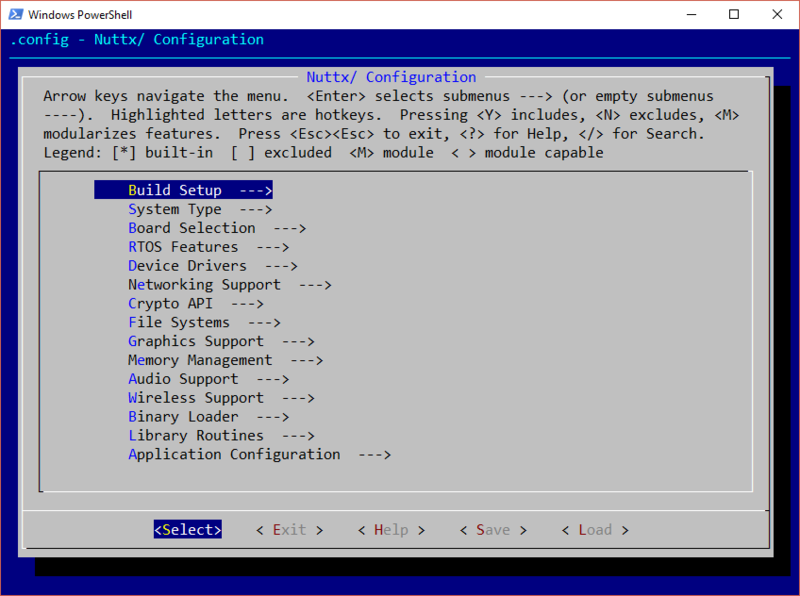 In “Building NuttX, In Ubuntu, From Scratch“, we showed briefly how to use “make menuconfig” to launch NuttX configuration. Lots goes on behind the scenes to make that work. The process of building the Linux kernel has two parts: configuring the kernel options and building the source with those options (see a nice article in Linux Journal for more basics). Since Linux kernel 2.5 (roughly 2003), a language called Kconfig has been used to describe the kernel’s configuration options, and the relationship and dependencies between those options. NuttX is no different, in that sense – it also uses Kconfig to manage its configuration options. In NuttX’s case, this ‘make’ performs several steps to prepare the subdirectories for configuration, and then launches a tool called kconfig-mconf. Kconfig-mconf shown running in Windows 10 PowerShell on the main NuttX configuration menu. When building NuttX natively in Windows (i.e. without POSIX-like helpers such as Cygwin, MSYS, or Windows 10 Subsystem for Linux), NuttX makefiles expect those three kconfig tools to be somewhere in the system PATH. UVC Ingenieure made an excellent start by figuring out how to build kconfig-mconf.exe for Win32 platforms. Reclone Labs has started a GitHub fork of their work, adding CMake build support for kconfig-conf.exe and a functional draft of kconfig-tweak.bat. In an upcoming post, we’ll present complete steps for building NuttX in Windows (requiring these tools).